Megan Sheehan accused a transit officer of breaking bones in her face, and leaving her bloody and unconscious. Bay Area Rapid Transit agreed to pay a San Francisco woman $1.35 million to settle a lawsuit alleging a transit officer broke bones in her face and left her bloody and unconscious. BART says in a statement it settled the lawsuit earlier this month and accepted full responsibility for the injuries Megan Sheehan received after an officer slammed her face-first onto the floor, the East Bay Times reported. Sheehan filed the lawsuit last year following her St. Patrick's Day arrest in 2014 at the Lake Merritt BART station in downtown Oakland. Sheehan's complaint accused an officer of violently beating her. In a surveillance video of the incident, an officer can be seen grabbing her hand and pulling it around her back, followed by her being forced quickly to the ground and the sound of a loud thwack. Sheehan is then seen lying in a pool of her own blood, face down. 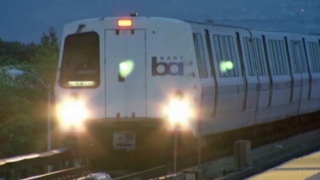 BART officials said in a statement the agency was committed to reform and ensuring such incidents don't happen in the future. "Over the past six years, the BART Police Department has undergone tremendous organizational change and has worked tirelessly to reshape and reform its approach to training and policing to better meet the needs of the communities BART serves," the statement reads. They say an internal investigation was put on hold when the lawsuit was filed, pending the outcome of the lawsuit. That investigation will now resume, and officials said "action that is deemed appropriate" would be taken at the conclusion of the investigation.